What is Online Reservation & Online Booking Software? Online reservations are used by travellers to book anything from a hotel room, hire car or a table in a restaurant. A Central Reservation System (CRS) will help you to manage your sales and to upload rates and availabilities to be seen by various different channels from the individual to travel agencies. 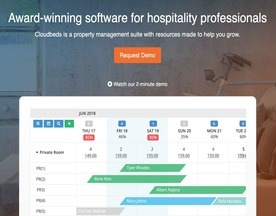 Cloudbeds is a browser-based property management system that allows property owners and managers to control every aspect of their property. Manage reservations, rate plans, reporting, customer reviews, emails, and more all from one place.